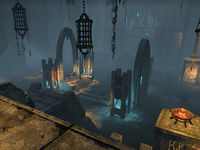 Abagarlas is an ancient Ayleid city whose inhabitants used to worship Molag Bal. 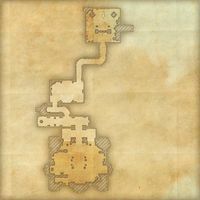 During the related quest, you travel to the ruins of the city and see it through the memories of Ostarand when it still housed the Mortuum Vivicus. 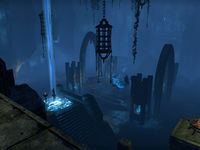 The second chamber of Abagarlas, where Prince Malyon can be found. "A shrine to the Prince of Lies. My stomache [sic] turns just to see it. Let's move on." "By the light, that must be the Mortuum Vivicus!" Abagarlas first appeared in Oblivion, where it is called "Lost Abagarlas". Its entrance is hidden in Sideways Cave. This page was last modified on 17 September 2018, at 17:16.